Item number DS401 - Aries - Image © Digital Sky LLC. Aries is a small and relatively faint constellation. The stars in it are faint and the figure is also not obvious to most observers. 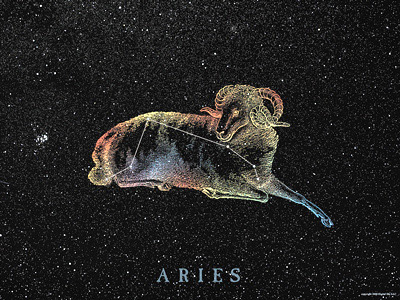 However, Aries is well known as the first of the zodiacal constellations. It has this distinction because in ancient times, the Sun crossed the celestial equator in Aries, heading north(above the equator), which marked the beginning of Spring in the northern hemisphere.